I really like my last three blocks, the first one started (and last one finished!) was an embroidered block by Kathy Schmitz called Stitch Crazy. I loved this one as soon as I saw it. I stitched it in a pretty green and pink variegated DMC thread. I like all the different stitches in this one, I’ve used herringbone, feather, lazy daisy, french knots, chain as well as the usual back-stitch. 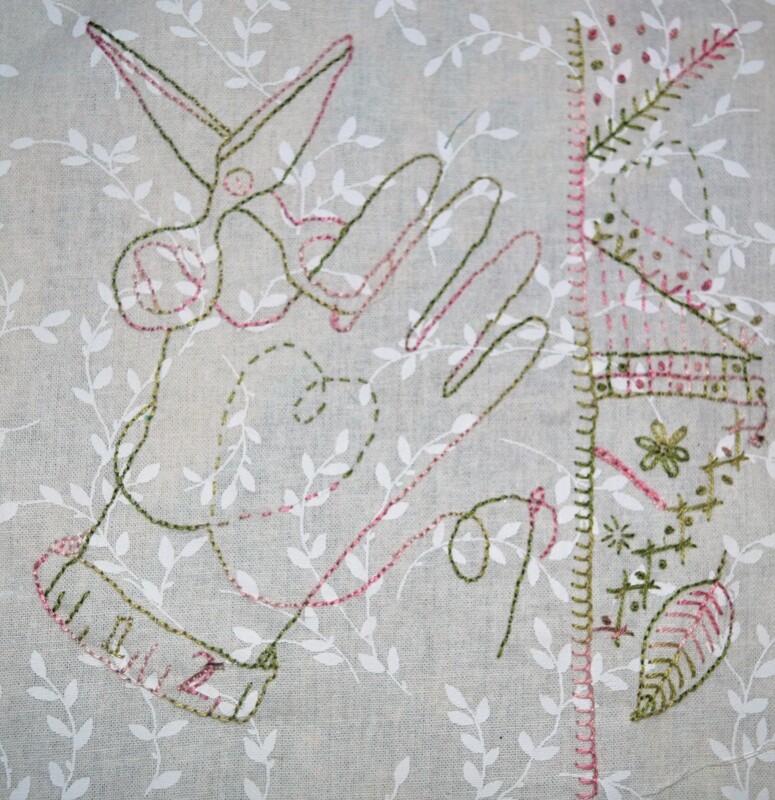 It took quite a while to embroider but I enjoyed stitching it. ‘Little Things’ is a block by Jacquelynne Steves, I thought it was going to be very fiddly to do with all those tiny triangles, but the instructions made it very simple, a double half square triangle block made from two half square triangle blocks, if that made sense!! 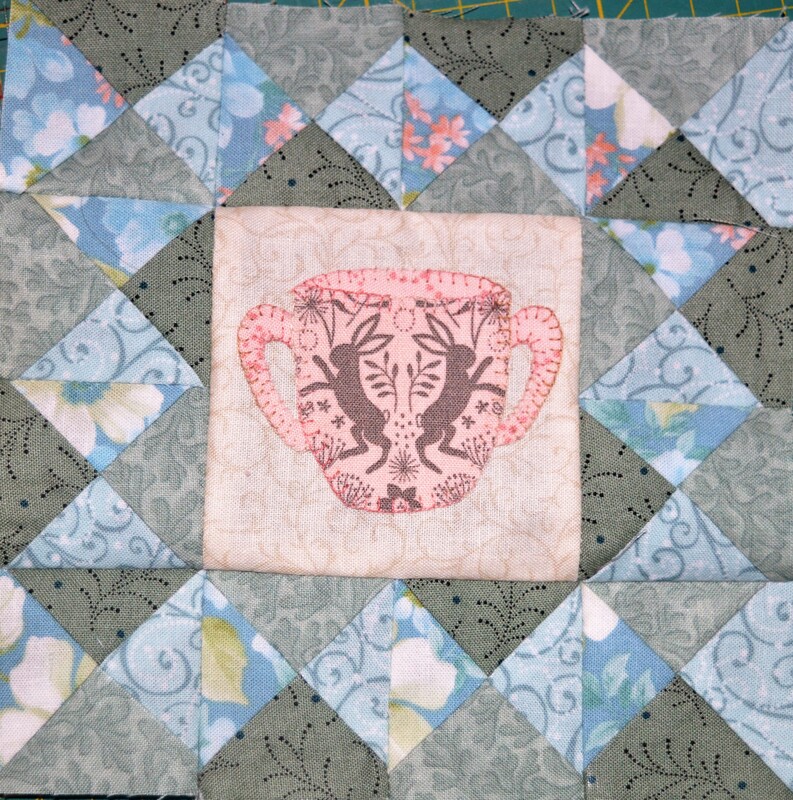 It was meant to be a cup and saucer in the middle but as soon as I cut out the cup in my bunny fabric it reminded me of the Peter Rabbit cups my kids had as toddlers, the ones with two handles,so I missed off the saucer and added another handle. I really like how this one has turned out. I wasn’t sure about the next one when I first saw it, it didn’t really inspire me much, but once I started playing with fabrics and working out which one to put where, I loved it. It’s called ‘Prism’ by Sara Lawson. 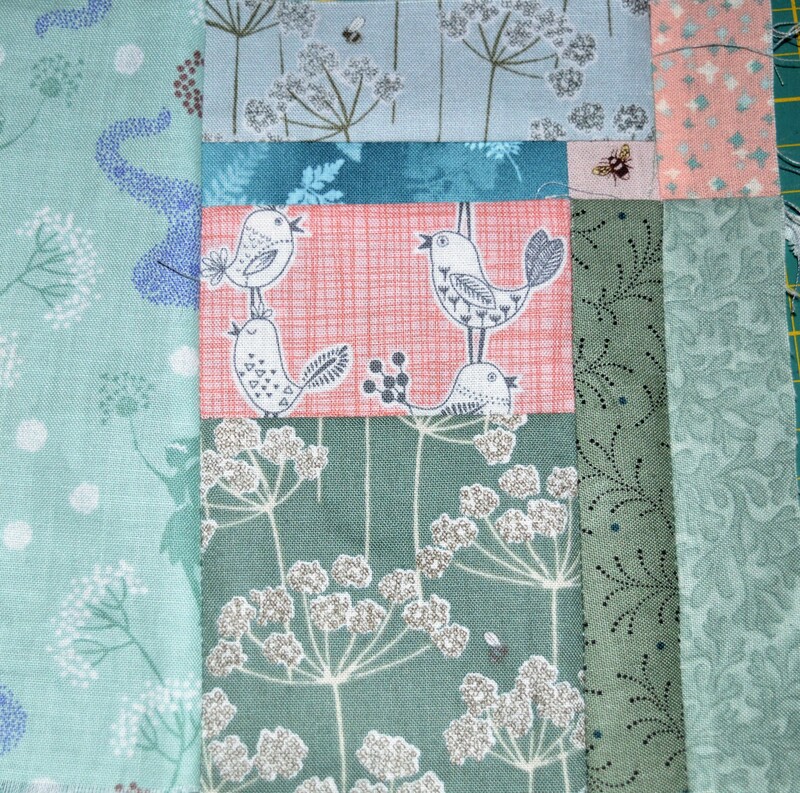 I did a bit of fussy cutting with the birds and the bee and then added the greens and blues around them. Sara says ‘I named my block Prism, and it’s in honor of all of the friends that I have met through sewing. I’m an introvert and have trouble connecting with people in real life, but sewing has given me a reason to meet many friends both online and in real life, from all over the world. I find that I have no difficulty talking about sewing with people and it’s really helped me blossom and become a better and more empathetic person.’ I’ve met lots of people through sewing, especially since starting my blog, so I could really connect with that. I’m going to concentrate on the last block for my Anderson Farm quilt now, it arrived a couple of days ago in the post, it’s a lovely block and all the sashings are there too, so I can crack on and get another quilt is finished! This entry was posted in embroidery, Quilting, Serendipity, Splendid Sampler Quilt and tagged embroidery, My Splendid Sampler, Quilting. Bookmark the permalink. Your blocks are quite lovely. I’m so far behind in making these ….. Thanks Kathy, I quite like being a few blocks behind, it takes the pressure off and it means I can pick one according to the time I’ve got. It’s the thought of all that sashing and quilting that’s beginning to worry me, I’ve quilted about 20, but there’s still a big pile to go!! Ooh, I’ve not seen it in teal I’ll have to keep my eye open for that one! Wonderful blocks! I love the bunny fabric too! Your blocks are lovely, and I chuckled reading that last para! Let us know what it does when you’re sewing a garment! “running stitch” LOL. You have some lovely fabrics there.